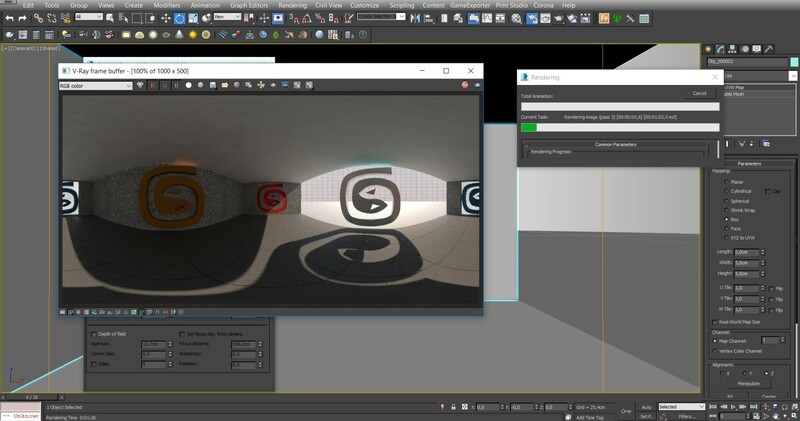 The following tutorial will explain how to create a 360° Panorama render using V-Ray rendering engine in 3ds Max 2018 to upload on Pillar|VR and create interactive virtual tours. 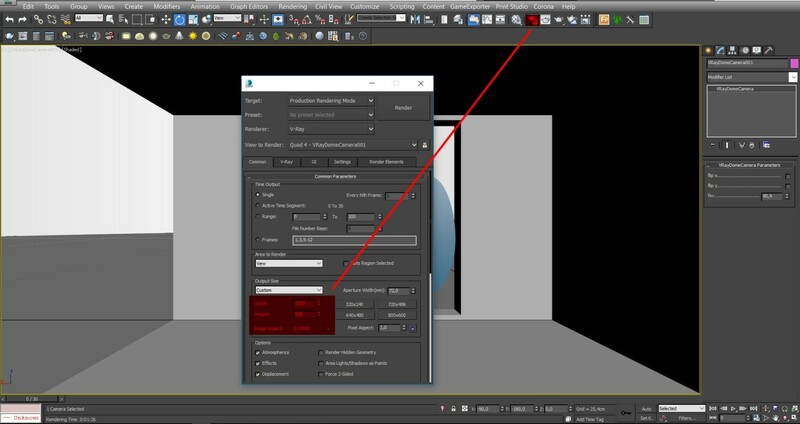 There is no need to own the latest version of software, you could use the same method with the older version of 3ds Max too. 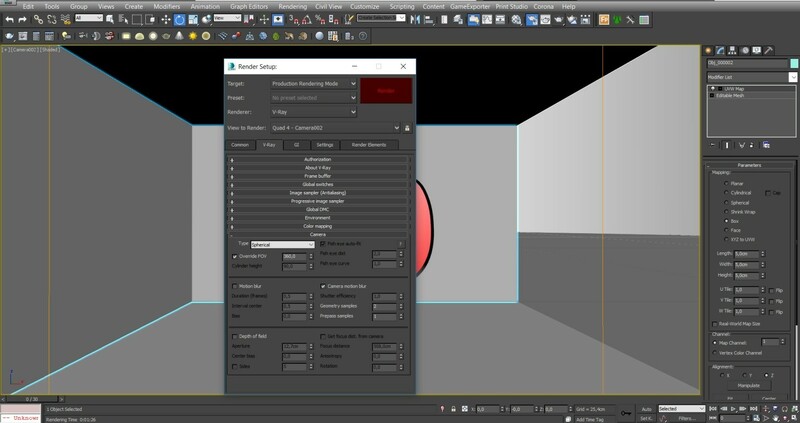 In the previous tutorials we explained how to create a 360° Panorama render using Mental Ray rendering engine in 3ds Max (click here to see it) and how to create a 360° Panorama render using Corona rendering engine in 3ds Max (click here to see it). Basically, the creation of the panorama is achieved by positioning the camera right in the middle of the scene and then by creating a single spherical image - as shown in the picture above – which will have our central camera as generation point. Then the spherical image will be automatically unwounded in a 2:1 rectangle by the software. The outcome of this procedure will be an unwounded spherical image ready to be uploaded on the Pillar|VR engine without further effort with V-Ray Render. To create the camera, first we should go on “Comand Pannel” – “Create” – “Cameras” – “Target”. Once we choose “Target”, we should place our mouse on the scene from above – “Top” – and click with the left button on the exact spot we want to place the observer (camera). Then, without releasing the left button, we should drag the mouse to the spot we want to observe (target). 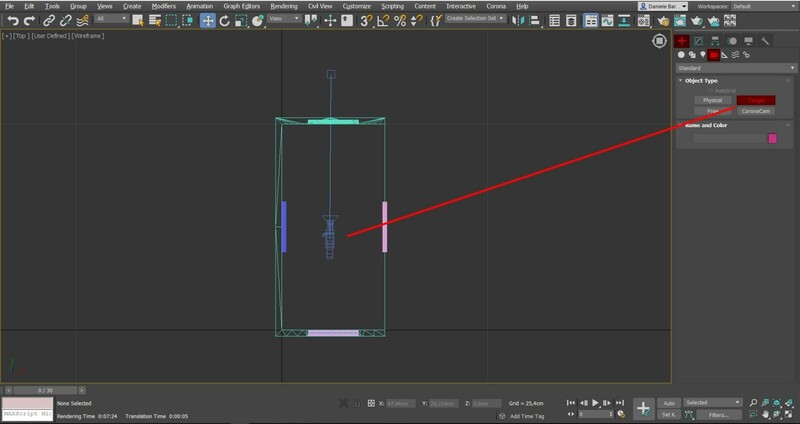 We are explaining the procedure to insert a camera in 3ds Max but obviously the same steps apply also if you use the internal V-Ray cameras. 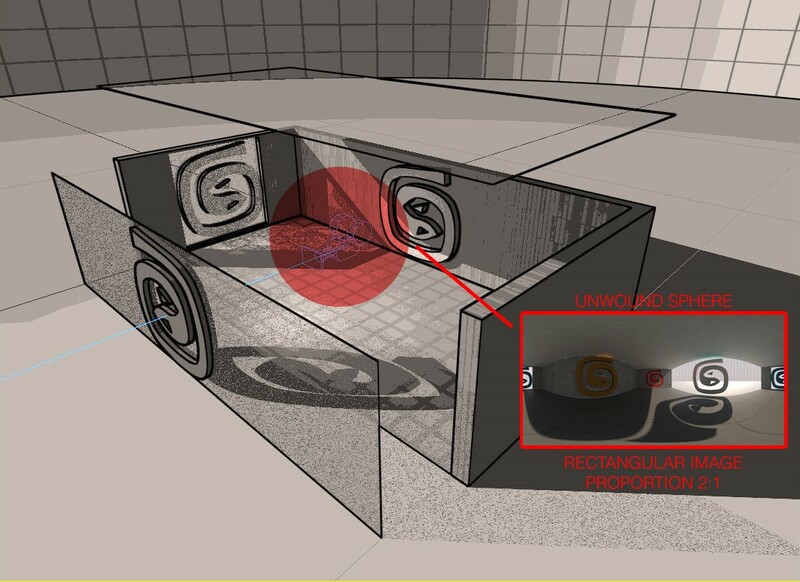 Now that the camera is set, we should also set the desired proportion for the render, as said the ratio should be 2:1. To set the proportion, we should open the “Render Setup” menu with the button that we find on the right side of the task bar at the top of the screen. Immediately a new window will appear, here we should go in the Output Size section and insert the desired values for width and height so that we obtain an Image Aspect equal to 2 – to obtain it we just must set the width twice the size of the height. At this point, we should add the Spherical set-up inside our camera. 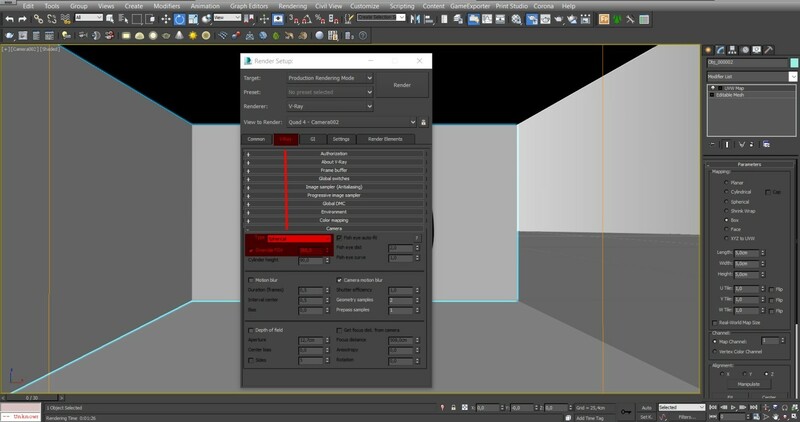 We should go on the “Render Setup” panel, then “V-Ray Panel” – “Camera”. Then in the drop-down menu next to “Type” we should select the Spherical option. 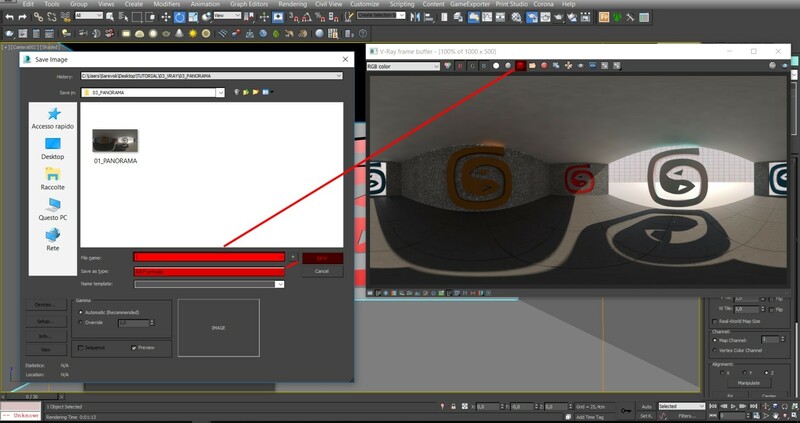 We should also flag the Override FOV that we find just under “Type” and insert the value 360°. We are now ready to run our render. Just be careful that the window where our central camera is placed is always active otherwise if a different window is active – with a lateral or top view – we obtain a normal lateral or frontal render and not a spherical panorama. Let’s now click on the “Render Setup” icon and then on the “Render” button in the “Render Setup” menu to obtain our 360° panorama ready to be uploaded on Pillar|VR. We just need to wait until the computation is done. 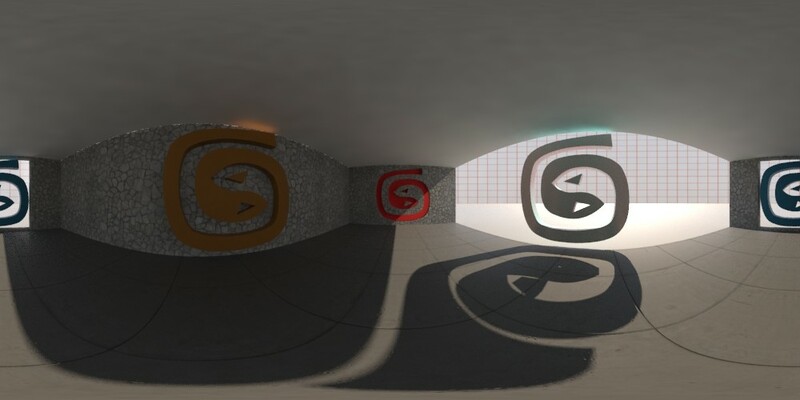 The output that the rendering engine will automatically give to us is an unwounded spherical image (as in the picture below). At this point, let’s save our spherical panorama with the name and format we prefer. Once saved the render, we could already upload it on the Pillar|VR platform to obtain a 360° interactive view of the room. Obviously, we will be able to upload the panoramas of every other room of the building and connect them with each other to obtain an Interactive Virtual Tour of our project to send to our customers! Author: Daniele Barone for Pillar|VR.